In the second of our summer hiatus episodes, Andy Saunders of thejeopardyfan.com brings back a few past panelists to irreverently discuss Jeopardy!. 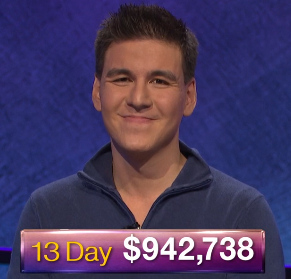 Andy Saunders of thejeopardyfan.com talks to recent Jeopardy! contestants Kelly Lasiter and Jill Staunton about their experiences as contestants on the show. Today’s Final Jeopardy answer and question (World Leaders), the July 12, 2017 game between Sara-Jane Whitaker, Gavin Borchert, and 1-day champion Kelly Lasiter. Today’s Final Jeopardy answer and question (Landlocked Country Names), the July 11, 2017 game between Kelly Lasiter, Scott Simpson, and 1-day champion Rich Blashka. Susan Corica returns as Jeopardy! champion this week. Check out his challengers as well as a map of all of this season’s contestants!